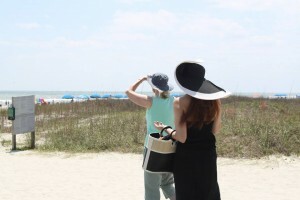 All of the beaches, from the ocean to the high tide water mark, on Hilton Head Island are public, but it’s the access to the beach that is private. However, there are plenty of places to park your car, or bike, and hit the beach, including all of the following locations. 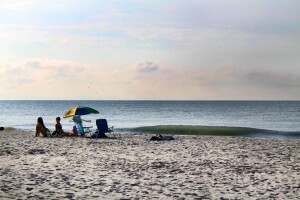 Each have their own parking available and there are designated swimming areas for Coligny, Driessen, Folly Field and Islander Beaches and during the beach season, there will be lifeguards stationed at those beaches. At the end of Burkes Beach Road, you’ll find a handful of metered parking spaces and a sandy path leading out to the Burkes Beach. Its location right next to Chaplin Community Park makes it one of the best beaches to visit on a bike, especially since that bike will get you down the sand pathway to the beach much quicker. 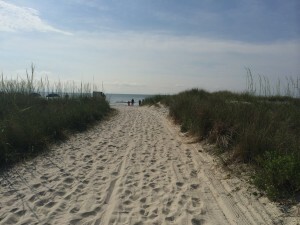 If you’re looking for the most popular beach on the island, this is it, Coligny Beach, located right at the end of Pope Avenue. Whether you want to bike, walk, ride a taxi or beach cart is all up to you. It’s one of the busier parts of town because it’s next to Coligny Plaza. Even if the walk out to Driessen Beach is a little long, it sure is worth it. This beautiful beach on Bradley Beach Road is a nice escape from the everyday activities. In the beach park, there is even a playground with all kinds of fun things kids will love. Fish Haul Creek Beach is another untouched beauty on Hilton Head. To get to this hidden gem, you’ll have to take a short trek through the woods (well, as woody as it gets on the island), by way of a path that even has a few stops along the way! Off of Folly Field Road, at the intersection of Starfish Drive & Sand Dollar Road, a sign welcomes you to Folly Field Beach. If you’re thinking about going here, consider visiting in the early morning when the sun colors the clouds in the sky and the two small parking lots haven’t filled up. 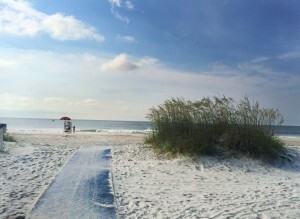 Not only does Islanders Beach have a great sandy seashore to enjoy, but it also has a park with a playground, picnic pavilions, grill, restrooms and sand showers. It’s by far one of the best places to bring you’re whole family or a group of friends for a long day at the beach. If you’re looking for a less crowded, quiet beachside escape then Mitchelville Beach might just be for you! 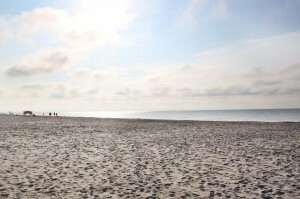 Located at 124 Mitchelville Road, this beach is one of the least populated. The trees inch right up to the beach, which has some grass that looks beautiful in the mornings & evenings. • Are not permitted – Between 10 a.m. and 5 p.m. Friday before Memorial Day through Labor Day. • Must be on a leash: Between 10 a.m. and 5 p.m. April 1 through Thursday before Memorial Day. • Must be on a leash: Between 10 a.m. and 5 p.m. Tuesday after Labor Day through September 30. • Must be on leash or under positive voice control at all other times. • Persons in control of animals on the beach are required to remove and properly dispose of the animal’s excrement. • Please take care of our beaches, Place litter in the trash receptacles provided. 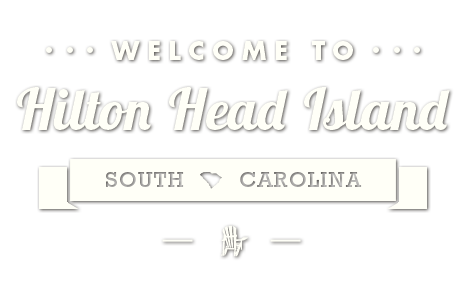 • Hilton Head Island’s official beach season is April 1st through September 30th of each year. • Surfboards, boogie boards, etc. • Sleeping on the beach between midnight and 6 a.m.
• Unauthorized wearing of lifeguard emblems, insignias, etc. 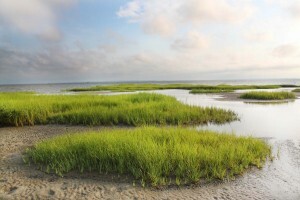 The Rules are contained in the South Carolina Personal Watercraft and Boating Safety Act of 1996. • No personal Watercraft may be operated at night. • All passengers on the craft must wear an approved flotation device. • People under 16 who want to ride a watercraft of 15 horsepower or more without an adult must first pass a safety training course. • The craft must be equipped to circle or shut off if the rider falls off. • No vessel may exceed idle speed within 50 feet of a moored vessel or other fixed object or person, NOR WITHIN 100 YARDS OF THE ATLANTIC COAST. • No one may jump a wake within 200 feet of the vessel creating it. • Anyone younger than 12 in a boat must wear a flotation device. • No boater may harass wildlife. VISITORS BEWARE – FISHING IS NOT FREE! If you are fishing on a licensed pier or with a licensed charter captain, you are covered under their permit. You don’t need a license if you are crabbing with 3 or less drop nets, fold up traps or hand lines. Fishermen need a license to crab with a crab trap or pot. The license process is easy and cheap. An annual resident SC saltwater fishing license is just $10 (14 day license for a SC resident license is $5). A non-resident can purchase a 14 day saltwater fishing license for $11 ($35 for the year). Licenses can be purchased 24/7 by phone at 1-866-714-3611 or online at dnr.sc.gov. You can do it in the car on the way to your fishing spot or buy it at Walmart. The minimum fine for not having a SC Saltwater Fishing License is $160 and each fisherman could be required to post a cash bond or go to jail. The maximum fine is more than $1,000. 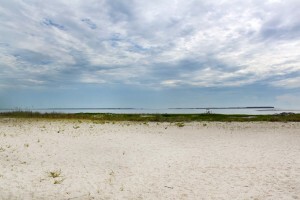 Saltwater fishing areas includes the beaches, all saltwater lagoons including those found in Palmetto Dunes and Sea Pines, public boat landings, and public and private docks and piers. • Sunburn – Soak in cool water unless skin is broken or blistered. Ibuprofen may help. • Bee Stings – Apply a baking soda paste and ice. If allergic, seek medical help. • Jelly Fish Stings – Apply vinegar, sugar, salt or dry sand. After 20 min., rinse with salt water. • Crab Bites – rinse well, disinfect, and apply antibiotic ointment. May need stitches. • Tick Bites – DO NOT attempt to remove the tick. Cover with vaseline or a film of oil. When insect is free, remove with tweezers. Look for flu-like symptoms for up to two weeks. If this occurs, seek immediate medical attention. • Snake Bites – CALL 911. Use a compression dressing just above site, NOT a tourniquet. • Oyster Shells – cuts and abrasions can result in serious infections. Medical treatment advised. • Alligators – Do NOT go near alligators. They run very fast. Do NOT feed or tease! • Sting Ray – rinse with water and apply heat to neutralize sting. Seek medical attention.